Ryota "John Takeuchi" Takeuchi is a Japanese Street Fighter player known for his Rashid play. Takeuchi came into the spotlight when the r/kappa subreddit crowdfunded his travel expenses so he could compete at First Attack 2016, an annual tournament held in Puerto Rico. He took the funding honorably, absolutely smashed the competition at the tournament, quickly became a fan favorite among fighting game players. 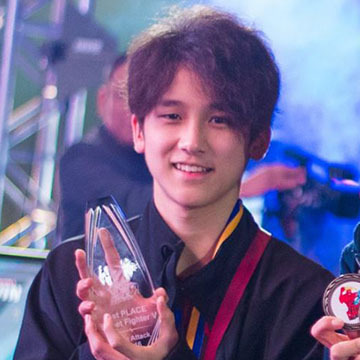 In 2018, John Takeuchi returned to the spotlight when he took second place at EVO Japan 2018, losing only to Infiltration. He became known for his outgoing and friendly personality, and for being the only professional Japanese player who uses a Pad instead of an arcade stick. Learn more about John Takeuchi at Liquipedia Fighters!